This dish is really craveable and easy. 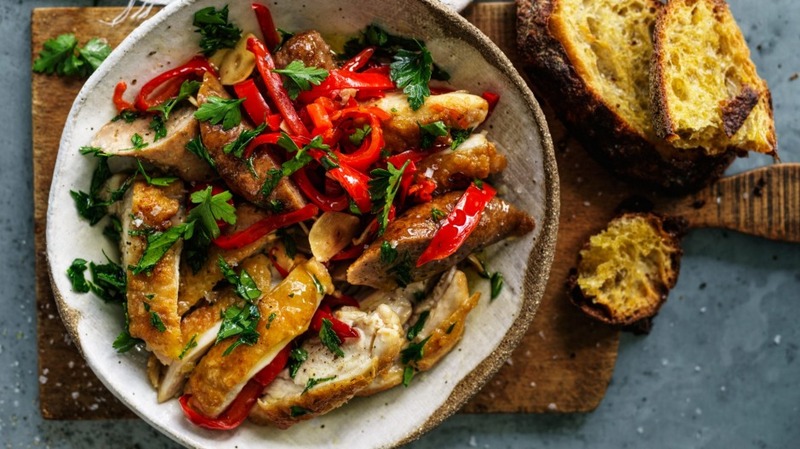 Based on an Italian-American dish known as "chicken scarpariello" or "shoemaker's chicken", it's hot and sour, sweet and savoury all at the same time and it uses ingredients you could find at any grocery store. I'm sure it will be become one of your favourite weeknight meals. Oh and don't forget some good crusty bread – you'll want it to mop up all the delicious sauce. 1. Preheat oven to 190C (170C fan-forced). 2. Season chicken liberally with two teaspoons salt and set aside. 3. Heat olive oil in a large, wide, heavy-bottomed, oven-safe skillet over medium/high heat. Dust the skin-side-only of the chicken with plain flour and shake off any excess. When the pan and oil are hot (but not smoking), and without overcrowding the pan, place the chicken skin side down in the oil to brown. 4. When the skin is browned, remove the chicken from the pan, add the sausages and brown on all sides. This takes about five to seven minutes. Remove the sausages from the pan and set aside with the chicken. If you cannot fit them all into the pan in a single layer, brown the chicken and sausages in batches, adding a bit more olive oil for each batch or use a roasting dish. 5. If the flour has burned in the pan, carefully wipe up the burnt bits before adding the capsicum, chilli and garlic to the pan with one teaspoon salt. Cook for about two minutes. You do not want to brown the garlic so if the pan is too hot, add a splash of water to cool it down. 6. Next add the chicken stock, honey, vinegar and oregano. Mix and simmer until this mix has reduced by at least half and is starting to thicken. Return the chicken and sausages to the pan (chicken skin-side-up), along with any resting juices,and transfer the filled pan to the oven for 12 to 15 minutes, until the sausages and chicken are just cooked through. 7. Remove from oven, rest five minutes, squeeze lemon over the whole thing and garnish with chopped parsley. Check the sauce for seasoning. It should be salty, sweet and spicy with a bit of sharpness from the lemon and vinegar. Adjust if needed, then serve straight away.